With the rear half of the truck taken care of, we turned our attention to the front. The first step was to remove the front sheetmetal in preparation to strip the front end down to the frame rails. 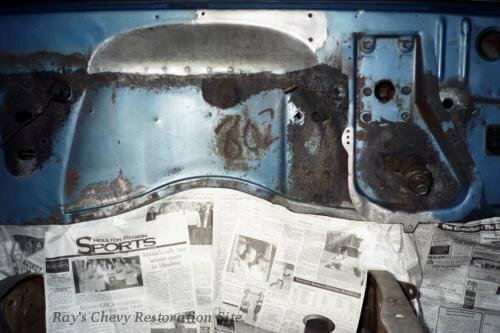 The front fenders, inner fenders, and doors were all replaced with new GM parts back in 1989 and they were still in very good condition. I just had to sand the old paint off and re-primed them to get them ready for the new paint job. 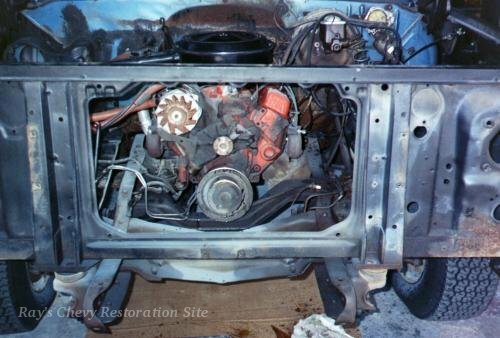 The hood and radiator support were original to the truck and both needed a little bit of work. I had to sandblast the radiator support to remove some surface rust. And the hood has some small rust holes along the front edge that I'll fix later. One interesting thing to note here is the engine color is Chevy Orange. 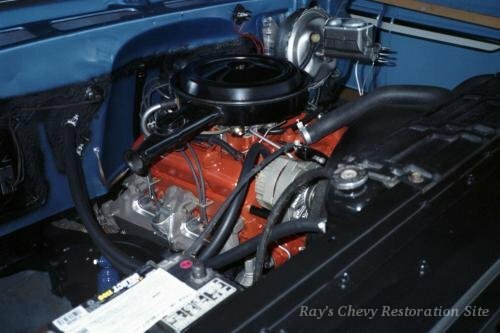 Most 77 engines (like the one in my 77 Nova) were painted GM Corporate Blue. 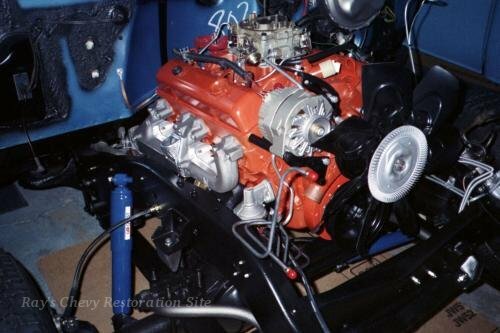 This truck was built early enough in the 1977 model year to still have an orange engine though. 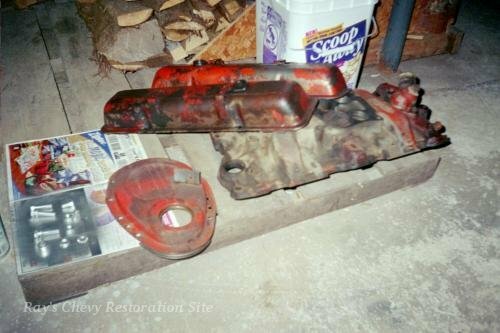 Continuing to strip down the front end, we pulled out the engine and were getting ready to remove the transmission and transfer case when this photo was taken. Here is the firewall cleaned down to the original paint and bare metal. Note the "802" written on the firewall. 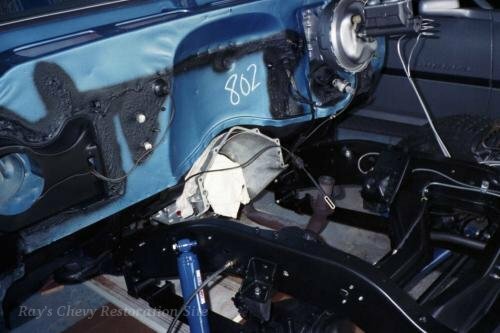 I believe this is some sort of sequence or order number as it was also written on the radiator support and the backsides of the interior door panels. It was originally written in white but most of the paint had come off in that area leaving dark looking surface rust. The rebuilt TH350 transmission and NP203 transfer ready to go back in the truck. 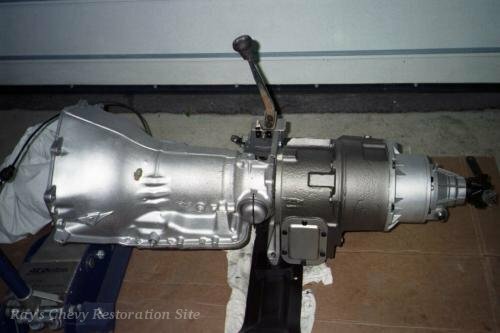 I installed a MileMarker part time conversion kit in the transfer case and painted the cast iron housing with some silver POR15 followed by a coat of Plasti-Kote cast iron grey. 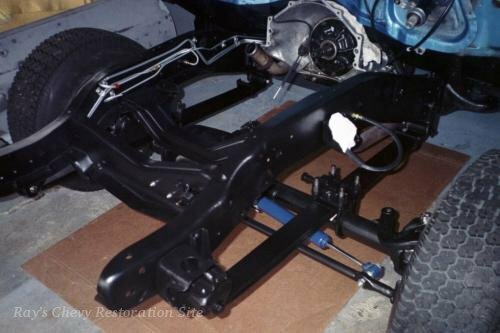 The front half of the frame was stripped down and repainted the same as the rear half. We didn't have enough room in the garage to pull the cab off the frame so I simply jacked it up enough to clean and paint the portion of the frame under the cab. 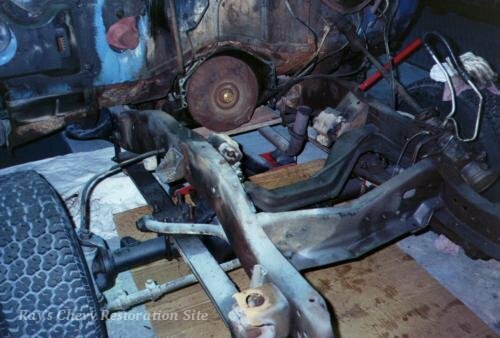 New front springs, shocks, brake lines, and fuel lines were also installed at this point. And here is the re-painted firewall. I duplicated the original "802" marking with a tire crayon and also re-sprayed some undercoating sealer in the same locations as was done from the factory. Some of the engine parts removed and ready to be cleaned and painted. The freshly rebuilt 400 back in the truck. It fired right up on the first crank! We ran it for about 25 to 30 minutes at around 2000 to 2500 RPM to break in the new cam.